ISRAELI WATER THEFT: Mohammed Abbas is sick, with chronic diarrhoea. Not for the first time. He and his family live in a Palestinian village with no running water, no sewage system, and no prospect of getting either any time soon. Watching her son, eyes closed, clutching his stomach on a mattress on the floor, his mother, Sunna, told me she is desperate. Sunna’s story is becoming increasingly common in the West Bank. The name of her village, Faqua, means spring water bubbles in Arabic, but access to water here disappeared long ago. The village council says most of the underground springs were appropriated by Israel in 1948 when the state was founded. An Israeli-Palestinian Water Committee was set up in the mid-1990s as part of the Oslo peace accords. But Palestinians say Israel makes it virtually impossible for them to dig new wells or to join Israel’s water grid. The West Bank is home to an important regional water source. According to a World Bank report published this year, Israel keeps 80% of water it drills from the mountain aquifer for Israeli citizens. Palestinians get the leftovers. It is not enough. While driving around Faqua village we came across a private water tanker, its hose rolled through the street into the Sallah family’s backyard. Murky-looking water gushed into an underground tank there. The World Bank warns the water quality is deteriorating. So Palestinians pay dearly. Unclean water makes people sick. Lack of water means prices are high. Munir Sallah says it makes a difficult life even tougher. “We need a lot of money to cover this expense. We could use the money for other things like food for example. “Every bit of money we have we use to pay for water. You’re not going to eat well. You’re not going to use much electricity. You need to save this money for water. But Israel says it is not to blame here – Palestinian planning is. Israel claims Faqua village never applied to join the water grid – although the local mayor disputes this. Israel says the Palestinian Water Authority should be more effective across the West Bank. “Israel provides water on demand to any Israeli, including settlers in the West Bank. “Palestinians are entitled to water. It’s their basic right under international law, but very often they are discriminated against in the allocation of this resource. 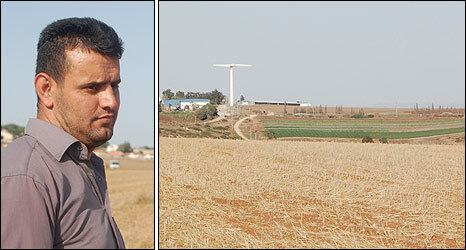 Up in the brown hills of Faqua, a frustrated Palestinian farmer shows us the lush fields of an Israeli Kibbutz next door. Faqua village is just on the boundary line between the West Bank and Israel. An Israeli army jeeps keeps a close eye on us from the other side of the metal fence – part of the separation barrier Israel is building in an around the West Bank. Ahmad Abu Salamah says Israel has given the kiss of death to agriculture here. Two former Border Police officers were sentenced to prison Monday for their role in killing a Palestinian teen in Hebron in 2002. Shachar Butbika and Dennis al-Hazub were convicted of manslaughter and accessory to manslaughter, respectively, and sentenced to prison terms of eight and a half years and five and half years, respectively, by the Jerusalem District Court. Amran Abu Hamadiyah, 17, died after he was forced to jump from a Border Police jeep traveling 80 kilometers per hour. Butbika and Hazub, together with two other officers who were convicted and sentenced earlier this year, assaulted several Palestinians on the same day. The first victim, Alaa Sankrut, then 20, was hauled onto the jeep, driven to a discreet location and kicked and beaten with a pickaxe handle, sustaining skull fractures. On their second drive that day, the officers abducted Abu Hamadiyah. He was beaten by Butbika and then forced to jump from the moving vehicle. He resisted, holding onto the jeep’s roof, but was eventually forced out. One of the officers shouted “he’s dead.” They drove away, without offering medical assistance, and tried to eliminate the evidence. The other two officers, Yanai Lalzeh and Bassam Wahabi, were given prison terms of eight and a half years and four and a half years, respectively. Israel has been accused of using Palestinian human shields during its invasion of Gaza, a breach of the Geneva conventions that prohibit intentionally putting civilian lives at risk.The Guardian has interviewed three Gazan brothers who described how they were taken from their home at gunpoint, made to kneel in front of tanks to deter Hamas fighters from firing and sent by Israeli soldiers into Palestinian houses to clear them. “They would make us go first, so if any fighters shot at them the bullets would hit us, not them,” said 14-year-old Al’a al-Attar. His brothers, Ali, 15, and Nafiz, 16, described how when the three of them were being led through built-up areas in their home town of ­Attartra, the soldiers would order them to suddenly stop ‑ then fire their rifles over the brothers’ shoulders and between their legs. The use of “human shields” is prohibited under article 28 of the fourth Geneva convention, which states: “The presence of a protected person may not be used to render certain points or areas immune from military operations.” Israel has ratified the convention and is therefore bound by it. An Israeli internal army magazine left behind by the troops shows Nafiz at the beginning of his ordeal being led bound and blindfolded in a line of men before he was stripped of his clothes. Another article in the magazine’s online edition details a separate incident, titled: “For a week and a half they [Israeli soldiers]lived with a family of Palestinians whose home became their stronghold.” In it an officer talks openly of using the house as a base for operations while keeping the family in a downstairs room. Though the officer claims the family stayed in the house out of choice, using their house as a base while civilians were on the premises could still be a violation of international law. The Attar brothers’ ordeal began on 5 January when Israeli troops entered the town of Attartra, 1.2 miles (2km) from the border with Israel, and began firing into their house. They were led away blindfolded and at gunpoint in single file as the gunfire carried on around them. At one point the boys were forced to march in front of and alongside Israeli tanks. They were then forced to kneel in a makeshift Israeli encampment for three days and three nights as tanks fired off shells around them. Human rights groups believe they were held there to deter Palestinian fighters from attacking. “After being here for a day and a half, they put barbed wire around us, then empty tank shells kept landing on us, a rock or shrapnel came flying toward us. We spent a further three days here, right here,” said Nafiz. After five days Ali and Al’a were untied, had their blindfolds removed and were released straight into a firefight. They came under attack from Israeli tanks and helicopters as they tried to find their way home through the ruins of their neighbourhood, the boys said. Nafiz was not so lucky. He was taken to Israel where he was interrogated for three days and says he was beaten. Finally he was taken back into Gaza and released. The boys’ parents, who are ardent supporters of Fatah ‑ Hamas’ political rivals ‑ cannot understand why they were taken. The use of human shields was outlawed by Israel’s supreme court in 2005 following several clearly identified incidents, but human rights groups insist the Israeli military continues to use civilians in this way, albeit less often. In February 2007, Associated Press Television News released footage showing 24-year-old Palestinian Sameh Amira being used as a human shield by a group of Israeli soldiers in Nablus. The Israeli army declined to be interviewed about the practice but said it gave strict orders to soldiers not to use civilians as human shields during this operation. In a written statement, it said that only Hamas had used human shields by attacking troops from within civilian areas. Hamas denied the claim, saying it would not endanger the lives of other Palestinians, but surveillance footage provided by Israel appears to show this. Israeli police have prevented Palestinians in occupied East Jerusalem from holding events to mark the city’s designation as “capital of Arab culture” for 2009. About 20 Palestinians were detained in and around East Jerusalem on Saturday, but there were no reports of violence, Shmulik Ben-Ruby, a police spokesman, said. Police reinforcements were deployed around the city and barricades were set up on routes to the al-Aqsa mosque, Islam’s third holiest site. Witnesses said that flags and banners associated with the event were confiscated. At one school, police and soldiers burst balloons in the colours of the Palestinian flag that the children were trying to release to mark the event. Hatem Abdel Qader, who handles Jerusalem affairs for the Palestinian Authority, was reportedly among those arrested. Ben-Ruby said the crackdown had been ordered by Israel’s internal security ministry because the celebrations violated understandings with the Palestinian Authority. Celebrations in Nazareth, Israel’s largest Arab city, were also cancelled by the police. “This measure is yet another example of the many extreme policies that the various ministries in the Israeli government impose on us,” one event organiser told Al Jazeera. “These measures are imposed on all artists and people who care about culture. This is a form of prevention of our freedom of expression. However, events were held in the West Bank. Mahmoud Abbas, the Palestinian president, and Salam Fayyad, the prime minister, received officials from Morocco, Tunisia, the United Arab Emirates, Kuwait, and Jordan before attending the ceremony at an auditorium made to look like the Old City. Israel captured East Jerusalem from Jordan during the 1967 Middle East war and annexed it as the Jewish state’s “eternal and indivisible capital”, a move which has not been recognised internationally. Palestinians demand East Jerusalem as the capital of any future Palestinian state. Jerusalem follows Damascus as the “capital of Arab culture”, a title that has been handed to a different city by the Arab League every year since 1996. Winners typically use the occasion to highlight Arab culture, sponsoring poetry, music, dance performances, lectures, school activities and sporting events.